« Liberation. 65 Years on. As Soviet forces approach the camp, the SS orders the evacuation of Gross-Rosen. The SS forces more than 40,000 prisoners on death marches to camps in the interior of Germany. Members of the SS kill any prisoner too weak or ill to continue the march. Thousands die during the evacuations, many from the lack of food or water. SS authorities establish the Gross-Rosen concentration camp, initially as a subcamp for men, as part of the Sachsenhausen camp system. The camp is built near the city of Striega, just south of the town Gross-Rosen (Pol., Rogoznica) in Lower Silesia. The SS transfers about 100 prisoners, mostly Germans and Poles, to the site to begin the construction of the camp. 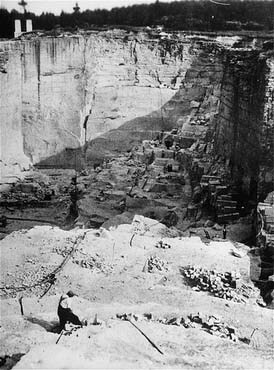 An SS-owned company, German Earth and Stone Works, takes over the quarry at Gross-Rosen and forces concentration camp prisoners to mine granite. The SS Economic-Administrative Main Office reorganizes the Gross-Rosen camp as an independent concentration camp, removing it from the Sachsenhausen camp system. The SS transfers the first group of Soviet prisoners of war (POWs) to Gross-Rosen for execution. About 20 Soviet POWs from the prisoner-of-war camp in Neuhammer are shot in front of the crematoria at Gross-Rosen. During this month, the SS transfers about 3,000 Soviet POWs to Gross-Rosen for execution. In the Commissar Order, Hitler ordered the summary execution of Soviet political commissars and other officials. The German army turned tens of thousands of Soviet prisoners of war over to the SS for execution. The SS Inspectorate of Concentration Camps sends evaluation forms to Gross-Rosen for the screening of prisoners. SS doctors in Gross-Rosen use the forms to recommend the killing of almost 300 ill or weak prisoners in Gross-Rosen. About half of the prisoners are later transferred to the Euthanasia killing center at Bernburg and gassed. The others either die in the camp or recover before the SS can arrange the transfer to Bernburg. The systematic killing of ill or weak prisoners is part of an operation codenamed 14f13, carried out by personnel from the Euthanasia Program in conjunction with the SS Inspectorate of Concentration Camps. During the Gross-Rosen camp’s existence, SS doctors also use injections to the heart to kill weak or ill prisoners in the camp hospital. SS camp authorities order the quarantine of the Gross-Rosen camp due to a typhus epidemic, halting all work in the camp. They allow no prisoners to leave or enter the camp. The SS will lift the quarantine after about a month. More than 1,000 prisoners die during this outbreak of typhus in the camp. German industrialist Oskar Schindler moves his Jewish work force from the Plaszow concentration camp in Poland to a factory in Bruennlitz (in the Sudeten region of Czechoslovakia). The new camp attached to the factory in Bruennlitz becomes a subcamp of Gross-Rosen. Schindler saves over 1,000 Jews employed in his factory by claiming that they are essential to wartime production. They will remain under Schindler’s care until liberation in May 1945. SS camp officials report that there are more than 75,000 prisoners in the Gross-Rosen concentration camp, including more than 25,000 women. As forced labor from concentration camp prisoners grew more important in the production of armaments for the German war economy, Gross-Rosen became the center of a vast network of more than 100 subcamps spread across Lower Silesia.